Photography is freezing a moment in time. The trick is freezing the perfect moment Henri Cartier Bresson one of the most influential photographers of the 20th century said it right “We must avoid however, snapping away, shooting quickly and without thought, overloading ourselves with unnecessary images that clutter our memory and diminish the clarity of the whole.”Which I translate into "wait for it", if it isn't happening "make it happen, and don't accept what is there, do what you can to make it yours. In this particular series. 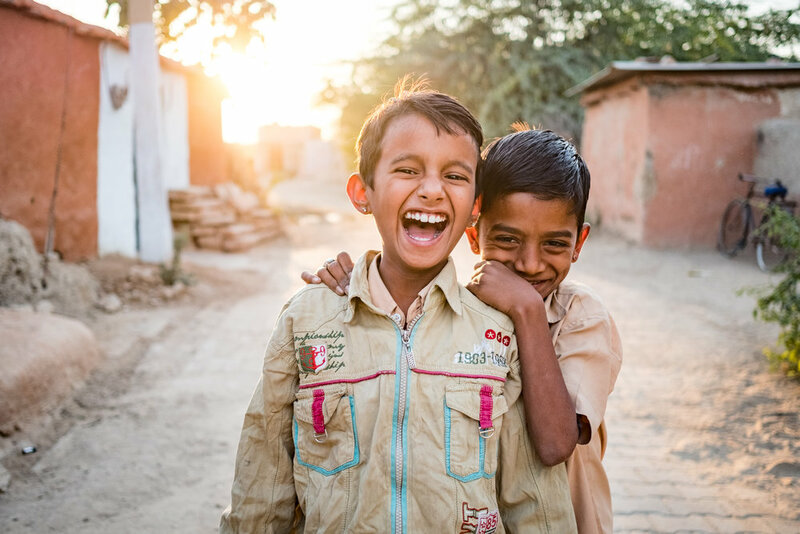 As I walked through the streets of a small village in Rajasthan I ran into these 2 friends. I could tell that they were close by how they were laughing and carrying on, and the light was perfect. Of course the minute I stopped to take their photo this is what I got. So that interaction that I was seeing had vanished, and they were in official school photo mode. So what do you do? Take more photos, and hope its in there somewhere. No way! What I saw was still there, I just had to tickle it out. I put the camera down, started talking to them asking their names and trying to communicate with them which of course they found very amusing. Next frame, and 3 minutes later, I get this. This one is my favorite. I knew I was getting where I wanted the image to be. I shot one more frame, and got this. Still the moment of joy I was looking for, but I like the body positioning in the previous frame. So there you go 3 minutes spent, 3 frames shot, and one successful image in my mind. At the end of the day its about having a vision of what you want, and getting the photographs to that place. Plus you need to know your gear so when you are ready to take the photo you don't mess it up. These are some of the photo habits I pass along on our Voyages to Bhutan, Cuba, India, Nepal, and soon Mexico.